A young boy named Darren Shan meets a mysterious man at a freak show who turns out to be a Vampire. 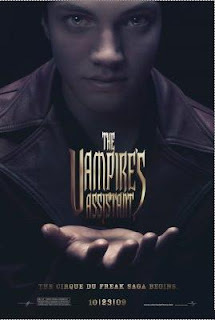 After a series of events Darren must leave his normal life and go on the road with the Cirque Du Freak and become a Vampire. I saw the preview for this the other day and it looks soooo good! I'd never heard of the book until like the day before when someone posted about it. I saw the preview and definitely wanted to see the movie! !